We have to stay out of the political fray, yet we couldn’t help but notice that it is the Democratic congressmen who switched from voting “No” to “Yes” on ObamaCare who are in the biggest trouble on the campaign trail. Pollsters Bill McInturff and Peter Hart found, in a pre-election survey on the Obama health plan and the 2010 elections, that health care is indeed a huge issue with voters. And they found that in the 92 most competitive House districts, 38% of voters support the health law and 55% oppose it. The intensity factor is high: Only 16% felt strongly that the law was a good idea, and 49% felt strongly that it was a bad idea. Those who felt it was a bad idea are most likely to vote. The poll was conducted for The Wall Street Journal/NBC News. Independents oppose the law by a two-to-one margin, and seniors are also strongly opposed (38% support, 55% oppose). After being told to basically shut up after the 2009 town hall meetings, seniors have been just waiting to have their say at the polls. Finally, the survey found that a majority of voters (51%) say an “acceptable” outcome of this election would be a repeal of President Obama’s health law. The more people find out about the next wave of costs, mandates, and losses of freedom, the more that number will grow. Consequential regulations: While the political debate is dominating the airwaves and public discourse, we continue to see more cause for alarm about the damage the law is causing on the ground. The National Association of Insurance Commissioners formally submitted its recommendations on Wednesday to Health Secretary Kathleen Sebelius about the crucial but deadly dull details involving a key set of insurance regulations. The NAIC caved into to leftist groups that descended in Orlando during the final meeting last week demanding that the rules be written in a way that would be most punitive to the health insurance industry. Most people think they don’t need to pay much attention to this because it’s just more regulations. But they may wake up very soon to find that millions of people no longer have the option of keeping their current health coverage because the company providing the policy couldn’t meet the new rules and had to pull out of the market. Many other Americans may find that premiums have gone up even further because of the rules. And tens of thousands of health insurance brokers may find they have to find another line of work (to quote then First Lady Hillary Clinton in 1994 when an agent realized that HillaryCare would put her out of business: “I’m assuming anyone as obviously brilliant as you could find something else to market.”). Brokers provide vital services to individuals and small businesses and losing them would cause chaos in the market. The rules that the NAIC drew up would govern the ratio that insurers must spend on medical care vs. administrative expenses. The NAIC has been wrestling for months with what should be included in both categories. Their final recommendations are unforgiving. Under the law, insurers in most markets must spend at least 80% of premium dollars on medical care and no more than 20% on administrative costs. (The split is 85-15 for large groups). The NAIC also decided that the rules must go into effect on January 1 — far too soon for companies to make changes to comply. Very few companies in very few states meet this test now. The result will be that many companies are likely to pull out of markets, especially those who serve small businesses and individuals where the administrative costs of selling and servicing policies is much higher. It also means that many employers will be forced to switch carriers, which will subject them to more expensive regulations because they will lose their “grandfathered” status. And health insurers will have to pay rebates to policyholders if they miss the 80-20 mark — which could drive premiums even higher. The NAIC itself warned, in sending its recommendations to HHS, that “we continue to have concerns about the potential for unintended consequences arising from the medical loss ratio.” That’s an understatement! 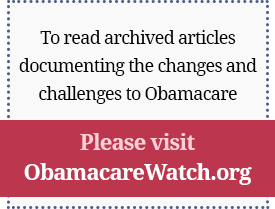 This is yet another example of the politicization of health care as a result of ObamaCare. People will lose the coverage they have, many companies will pull out of markets, costs will go up, there will be less competition, and no one will be better off. But liberals are happy because the insurance companies have been punished! HHS will likely decide next month whether to go along with the NAIC recommendations or amend them. If Sec. Sebelius doesn’t provide more flexibility, the next Congress should demand a longer transition to the new rules — until the whole destructive law can be repealed and replaced with sensible reforms that get the incentives right and provide real competition and choice. We hosted a conference call for the media and policy colleagues on Wednesday to provide more background and insight on these regulations, and we would be happy to send you the link to the recording. Just send me a note. Puerto Rican madness: There has been a decades-long partnership between the mainland and the Commonwealth of Puerto Rico that has facilitated the creation of hundreds of thousands of good jobs, largely in the biotech and pharmaceutical industries. The tax advantages for offshore companies to operate there have been phased out over the last decade, and over the past weekend, the Puerto Rican government dealt another self-destructive blow to the jobs creation engine. Gov. Luis Fortuño supported a law that slaps $5.8 billion in new taxes that targets several dozen international companies. The law was drafted on Friday, approved on party-line votes by the House of Representatives and the Senate on Saturday, and signed on Monday. There were no public hearings, no discussion with the companies, and no opportunity to analyze the impact of the legislation. The new tax goes into effect on January 1, 2011. Most of the several dozen companies that will be hit are pharmaceutical and biotech companies that already have had their research budgets drained by ObamaCare’s taxes. The biotech industry alone accounts for at least one-quarter of the island’s GDP and is responsible for 100,000 jobs. This new tax will have a huge and negative impact on future investments. The governor says the tax is “temporary,” but who believes that? Companies who were planning to expand operations on the island now are looking to Singapore and other sites instead. The governor is sponsoring tax cuts for individuals and island-based companies, which is a very good thing, but the dark side of this deal was this tax increase on companies that are huge employers on the island. This is a jobs-killing tax hike on business while the island is stuck in a four-year recession. This is bad policy passed in a reckless way. What is it about politicians who think that companies can absorb absolutely anything they dish out and still chug along creating jobs, profits, and paying taxes? At some point, the engine stalls and working Americans are the ones left holding the pink slip. There is a reason the U.S. economy has such high unemployment. The job of the next Congress will be to lift regulatory burdens, reduce taxes, and provide new opportunities and incentives for people to work, save, and invest. It can’t begin a day too soon. Many embattled House Democrats who voted for ObamaCare just seven months ago no doubt wish they had listened to the American people rather than to their leadership and said “No!” to the health overhaul law, Turner writes. There will be huge political consequences for slamming such a massive change into law — one that will directly affect virtually every American and every corner of the health sector. If Republicans capture the House on November 2, expect dozens of hearings to point out the many problems we already are seeing with the law — from driving up costs, to causing millions of people to “lose the coverage they have today,” to massive new deficit spending on new entitlement programs, to budget-busting Medicaid mandates. Will Regulation Thwart the Personalization of Medicine? Health Care Reform: What Are the Big Changes for Small Businesses? Grace-Marie Turner will discuss how the health overhaul law will affect small businesses. Will the New Congress Repeal Health Care Reform?